Morning paddle out past the point and back. I had headed out with nothing really in mind except some exercise. Chewing on life issues and decisions that need to be made, I was preoccupied and distracted. I should have known the sea would change everything. On the horizon, small black protrusions. Marlin? No, too close to shore. Nor were they the fins of sleeping seals. Instead, a pair of small bat rays had caught my eye, ‘flapping’ their ‘wings’ in an undulating pattern as slowly they made their way through the glassy early seas. In the distance, one of their buddies did a couple of back flips. 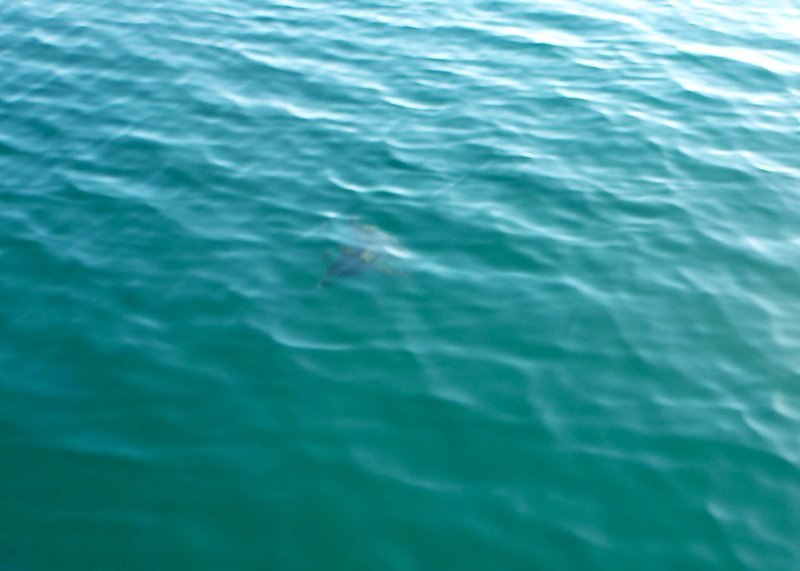 When one crossed under my board, I tried to grab a photo – but the image doesn’t do justice the the ray’s elegant form. But the rays presence triggered a clearer focus of the richness around me. Overhead, the gentle glide of the Elegant frigatebird. Nearby, a cormorant surfaced, a small fish gleaming from his beak. A school or rainbow runners, their hypnotically blue fins trailing, raced under my board, likely chased by a bigger fish. Several jellies drifted just below the water’s edge, the flower patterns in their gelatinous bodies so lovely from above. And then, surprise of surprises – a marine show! A medium size fish began to leap and skip across the water – chased by a large green and yellow dorado, who leaped in equally high arcs following his prey. What was I worried about earlier? This entry was posted in Baja Living, Casa de Catalina, Fish, Sea of Cortez, SUP and tagged bat ray, Cormorants, dorado, Jelly Fish, rainbow runners. Bookmark the permalink. Moving to Haiku, Maui in October. Looking forward to it. You were an inspiration to start this adventure.